Join us for our final day of celebration this Women of Color HERStory Month® 2016, as we host a special salon session with Paris Hatcher(@parishatcher)founder of;Black Feminist Future, next Saturday, March 26, 11:30a-1:00p at Bricolage, 937 Liberty Ave, 15222. Carrying on from past collaborations, Paris will be leading us in a salon session about the future of Black women and girls across the country. To view the Black Feminist Future Report 2015, view this interactive Prezi! Paris is in town, as the featured speaker for the final Women of Color HERStory Month 2016 event and You Wouldn't Expect Dinner + Discussion at 5:30p. Unfortunately, the dinner and discussion is SOLD OUT. 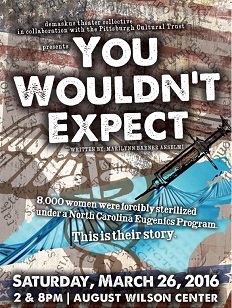 However, the You Wouldn't Expect play* with its 2P and 8P performance times at the August Wilson Center is about the forcible sterilization of 8,000 Black women in North Carolina (see below for more details). Paris Hatcher is a Black, queer feminist from Greensboro, North Carolina. With over 10 years of experience on the local, national, and international level, Paris has been working with leading organizations to amplify the leadership of marginalized communities, win public policy campaigns, and advance reproductive and sexual health and justice, gender justice and queer liberation. Notably, she co-founded and was the Executive Director of SPARK Reproductive Justice NOW, one of the leading reproductive health and justice organizations in the Southeast. She completed her Masters of Arts in Africana Women’s Studies at Clark Atlanta University with a research focus on Caribbean women’s activism and social movements. Paris was a Board member of Southerners On New Ground (2008-2014); a founding Board member for the Groundswell Fund (2007-2012). She recently worked for Race Forward, the Center for Racial Justice Innovation as the Network Strategies Manager. Currently she is Principal at Rhombus Consulting Group, rabble rouser extraordinaire at Black Feminist Future, and co-founder of Black Freedom Outfitters.